In English, photography can be defined as a “light picture,” or more specifically, the act of capturing images by recording light via an image sensor; however, in Japanese it also means to “expose (or to reflect) truth.” I like both meanings of the word in respect to my art. Nevertheless, I find that when I am taking my own photos, I tend to take pictures more so along the Japanese context of the word, as my character and nature as a photographer is to view anything that comes my way from a bit of a different angle each time. By reflecting a scene from the real world (one that is physical) in my photographic works, another view of the world emerges – one that most people do not see; a passing image that fades away in a moment’s time. I had photographed Masato Kuroda for this photo essay, a Japanese artist and a personal friend of mine, whilst spending a day with him during the early spring in New York City this past year. He had first started his career as an actor, while attending Komazawa University in Tokyo, Japan. During that time, Kuroda had been getting involved in many Japanese underground film productions with his mates, who he had been friends with for over 10 years and who were then in their early to mid-20s. The turning point in his career came around five years ago (2007), when he arrived in the United States. He traversed throughout Hawaii and New York, where he eventually chose photography as a way of expressing himself as an artist, without having to leave his love for the visual arts. Recently, he has been envisaging and realizing his thoughts and dreams in the Big Apple. Influenced largely by the works of renowned Japanese author Haniya Yutaka, the French philosopher Jean-Paul Sartre’s “pratico-inerte,” and by the works of French filmmaker Jean-Luc Godard, Kuroda has gathered and added great vestige and profoundness to his life and to his works. Kuroda never dresses in fancy attire, and is always very natural and civilized, without pretending to be someone that he is not. He doesn’t believe in taking shortcuts in hopes of becoming distinct and high-ranking like many young artists of this generation try to do without proper effort; instead, he quietly and humbly, but with determination, goes against the instilled methods of the contemporary art world. “I want to take new pictures. I want to create something new throughout [the] whole visual art history — the image that nobody sees. 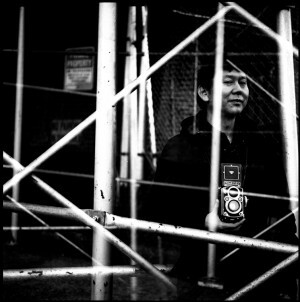 At the same time, I think photography is [a] very vague genre. It is commercial, [but] at the same time, [it is] art. However, it is [an asset] that the position of photography is obscure. If photography only belonged [in] high art, it immediately would end up [in a] dead end. The ambiguity is important for new photography,” Kuroda says. However, being a photographer myself, I see this particular art form as a troublesome genre at times since almost all of the aesthetics of photography can be seen as borrowed elements from other fields, such as painting and its distinct composition of light and shadow. Admirable genres in art are often regarded as being composed of fundamentals that only that particular genre can explain. Therefore, there are moments in time that I think that photography should revolutionize itself into a new genre of art by creating new models that are not evident in other areas, while at the same time discontinuing the usage of those techniques taken from other art forms. Kuroda does not agree with these thoughts. And perhaps he is right, since photography could easily become boring to the person behind the camera, if it were to be predisposed to certain unwavering elements, and disallowed the use of others. One’s artistic intuition would certainly disappear, including the basic idea of the artist’s aspect of “seeking his/her own individuality,” which corresponds respectively to their creativity. As such, Kuroda doesn’t believe in improving upon old and new ideas. His method of direction is arbitrary; susceptible to chance, one’s mood, and the environment.